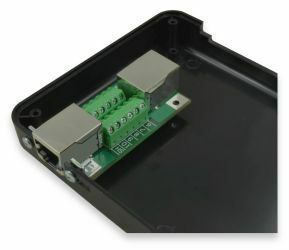 These slim profile breakout boards bring all 10 signal pins plus shield of a 10P10C (RJ50) connector out to screw terminal blocks, allowing simple and quick connections for prototypes or permanent installations. 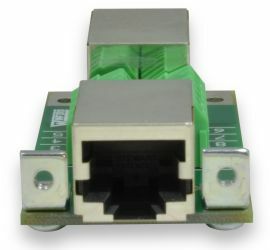 This board also functions as a coupler (wired 1:1), allowing the user to easily insert it between cables; all the signals pass through, while the desired signals can be monitored or connected to other equipment. 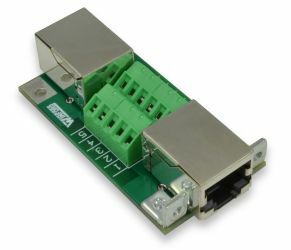 These breakout boards are perfect for field wiring tasks and are designed to be mounted in a panel, thus providing a convenient method of passing an RJ50 connection through a panel. The compact design of this board takes up minimal area on the panel surface, thus potentially allowing many connections in a relatively small area. This breakout board is perfect for production applications as well as experimentation and prototype work. It is well-suited for work with communications, sensors, data acquisition equipment, and any other device that uses an RJ50/10P10C connector. A breakout board is sometimes referred to as a "transition module", "terminal board", "terminal block", "breakout box", "breakout adapter", "terminator", or "interface module". These couplers are designed to mount behind a panel face and extend through the panel. One end of the board features sturdy metal angle brackets with threaded holes (#4-40) to provide panel mounting capability. The RJ50 connector extends approximately 3 millimeters past the end of the circuit board, and thus the connector face extends toward the front of the panel. A cutout must be made in the panel to accommodate the RJ50 connector, and two holes are needed for the mounting screws. For more information on appropriate panel cutout size and locations, please see the product data sheet. Approximate dimensions: 2.41" x 1.22"